Buy 48 or more for $8.54 each. Cyprian of Carthages story is one of incredible perseverance for the sake of the gospel. Living through a time of terrible persecution towards Christians, Cyprian wrestled with questions surrounding the church and contributed greatly to the writings on its importance as the bride of Christ. He dealt firsthand with the effects which persecution has on church bodies and offered many insights which are becoming increasingly relevant in the West today. Brian Arnold joined the Phoenix Seminary faculty in 2015 and teaches courses in Systematic Theology and Church History. He has prior teaching experience as a Garrett Fellow at The Southern Baptist Theological Seminary, where he served as a lecturer. Brian Arnold guides us to a compelling voice from the past at a time when we desperately need wisdom for the present. This is a valuable book for those seeking a formative conversation with the Church Fathers. We would do well to listen. A fascinating, stimulating and easy to read book on a theologian who loved church. It is a book about a great man that should change and challenge and bring joy every time you meet with and think about your church. Arnold purposes neither to re-make Cyprian in his own image nor to discard the Carthaginian bishop on the ash heap of history. Arnold rather insists that Cyprian can serve as a stimulating conversation partner within the contemporary context. Immensely rewarding and full of exquisite detail, this book is a winner in every respect. More, please. 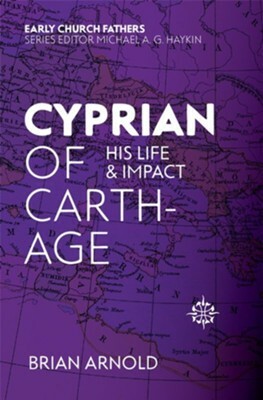 I'm the author/artist and I want to review Cyprian of Carthage: His Life and Impact.